I was already tempted to read this author when I read your last review around Christmas (and also got the book by now) but this one sounds even more tempting. And so does the movie. What a trio of actresses. The characters do sound very varied and nuanced. So much seems to be hidden behind appearances. It doesn’t really give the impression the author was in favour of the institution “marriage”. I really like the quotes and the idea of different narrators is attractive. I agree with Caroline, in the author’s vision marriage seems to be more a prison than a cosy house, a place were you’re not free but hidden from the rest of the world. 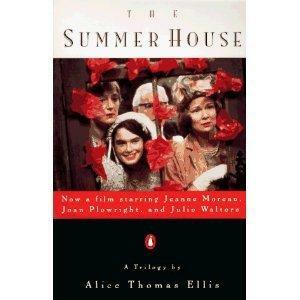 Caroline & Book Around the Corner: I think The Summer House is a better book than The Inn at the Edge of the World. Fizzing with wit and the rueful wisdom of women who have seen–and borne–every species of male misbehavior….. I didn’t see it that way. Yes, the male misbehaviour is blatant, but there’s a lot going on with the women too. Monica’s pathological determination to get Margaret to marry Syl is one huge problem, and then there’s Lili…. One big theme is guilt. The author was very religious–Catholic. Margaret is basically so torn with guilt that she’s immobilised, whereas the word ‘guilt’ does not exist in Lili’s lexicon. Funnily enough, while Lili is termed ‘amoral’ because she’s so proactive, she seems to be the most mentally healthy person in the book. Wikipedia says that the author was ‘bitterly opposed to feminists in the church’ and this is contrasted to the idea that her work often seems feminist. There’s mention of a convent, a few nuns and a priest in the book, but basically the characters have to work out their own problems without redress to a so-called ‘higher order’. Lili has the idea of harem culture in her background, and that’s interesting, even though she’s escaped it by timing and history. But you almost get that harem idea with Monica, the retired wife who’s still ‘kept’ in luxury by her X. Thanks for the explanation, the book seems thought provoking. I don’t like so-called feminists who at the same time expect men to open the doors for them and do all these little gestures “owed” to women as inferior fragile beings. That’s not my idea of equality. I’ve read all but one of the author’s books and they are all excellent. The Inn at the Edge of the World did not seem to be concerned with women-centred issues (unlike The Summer House). Well if you find any good ones, let me know. Thanks for a re-cap of this wonderful book. You’ve inspired me to re-read it….I remember it being a favorite, until I read her Sin Eaters, which I liked even better. She reminds me a lot of another British writer with a wicked sense of humor, Penelope Fitzgerald. She’s the best of the best….have you read her? I’ve read several Fitzgerald (not all) and while I liked The Book Shop, I wasn’t crazy about the others.